The day was so beautiful today, sunny and warmish. I headed up the coast about 15 minutes to Arcadia Beach. It is the beach on the north side of the old roadbed carved in the rock at Hug Point. 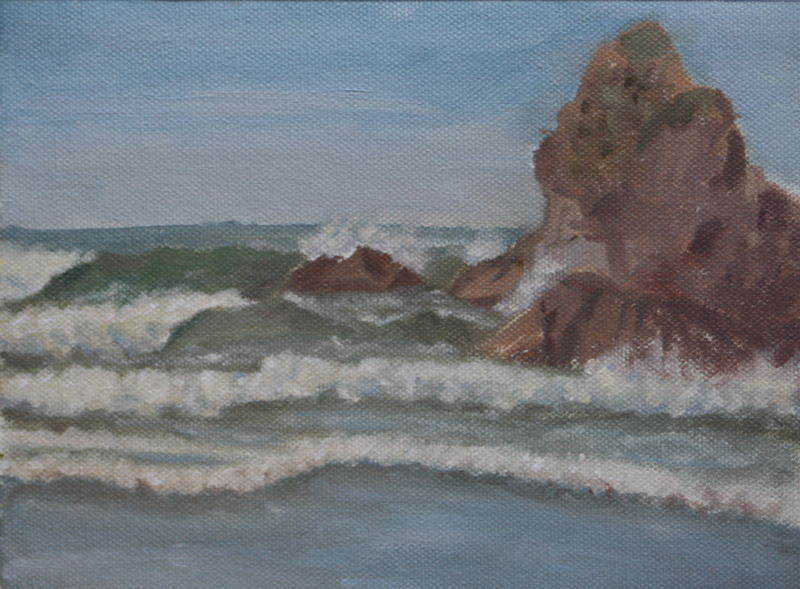 I also decided it is time to start learning to paint the rocks interacting with the waves. There are a lot of rocks around here. 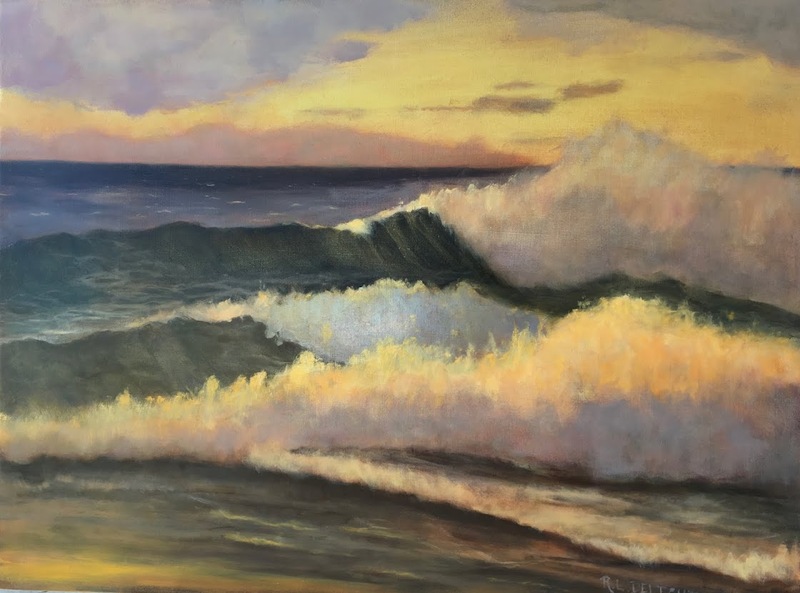 I spent a lot of my time painting the rocks in this painting so the waves are not as carefully done. I also concentrated on refining the color. One of the interesting aspects of seeing all my paintings from the month of January together in the poster I posted yesterday was seeing the colors choices and style of painting I have developed so far. While I am pleased with my progress, I am not where I want to be yet in painting skill. I really would like my seascapes to look more realistic than they do. Color and value are the main technical areas I need to work on. I think the values in this scene were much more dramatic, had more contrast, in real life. The colors of the rock are pretty close but not quite there. The ocean colors are very close but, as I sort of ran out of time, I didn't quite refine them as much as I would have liked to. Overall, I thoroughly enjoyed painting this today! The tide was coming in and even though I was pretty far up the beach, I wasn't quite far enough. 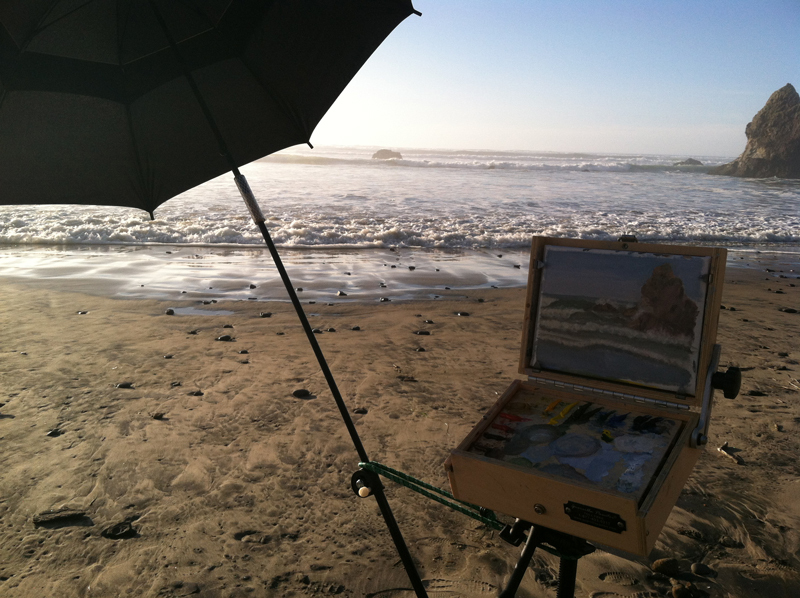 I had to grab my tripod easel and lift it high while a wave washed around my feet. I use a timer on my phone to let me know when an hour has past and reset it for another hour until I am ready to leave. That way I don't have to keep pulling out my phone to check the time. Yeah I know, get a watch, but I don't like to wear bracelets, necklaces or rings (other than my wedding ring) very often. A watch is like a bracelet. Clip on watches I might consider but most of the time I have bulky layers and rain jackets on which would make it hard to read.The phone fits in a handy pocket and is easy to get to and I only have to pull it out to reset or turn the timer off. My timer had just gone off and I happened to have my phone in hand when I saw the water massing up, getting ready to run up the beach in the form of a sneaker wave. I calmly took this picture and then grabbed the tripod as the water came rushing up. Incoming tide water, time to run! I finished up soon after taking this and headed for home. Tomorrow and the next day are my weekend and I will not be painting (sketching yes, I always have a sketchbook handy). I have something fun and art related to share on the blog tomorrow and I will have something to share on Monday too before heading back to my studio or the beach. I am nodding off already so I will sign off on this post and get to bed! Oh, one last thing, the Tinker Toy fix on my umbrella worked just fine!